Playa Del Carmen: Cold drinks, warm weather, sunny skies, crystal blue waters, and wonderful hotels…Do any of those sound good to you? 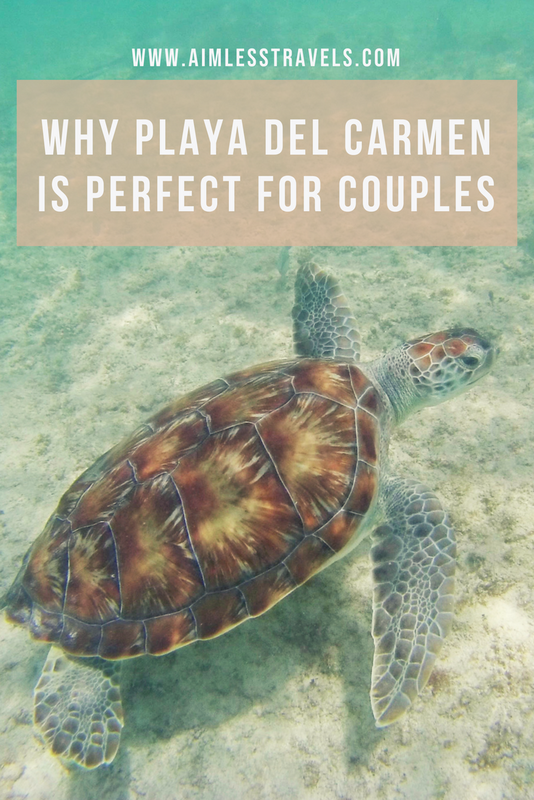 Playa Del Carmen may just be the perfect destination for you and your loved one. Quintana Roo offers tons of all-inclusive hotels and fantastic excursions that you just can’t find anywhere else for a better price, making it the best couples retreat for thrill seekers or relaxers! 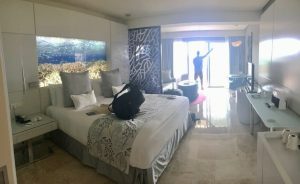 Is The Hype About 5-Star Hotels in Playa Del Carmen Really True? Paridisus La Perla in Playa Del Carmen was the perfect amount of boujee, upscale, and modernesque that we were looking for. Our room made us feel right at home, with a huge bed, large indoor tub and double showers, double vanities, and a small living room. The parameters of the hotel were surrounded by a pond filled with koi, goldfish, and friendly turtles that loved to eat anything you offered them. How could you not be excited to stay at a place like this? The hotel’s staff were friendly and spoke great English. They made it easy for us to book our excursions and arrange for transportation there and back. This was a swim-up bar located in La Perla at Paradisus. It was nice to have an all-inclusive NOT include bottom shelf liquor! Paradisus La Perla was also an all-inclusive hotel adults-only (18 years and older). This meant that all food, drinks (alcohol included), and certain hotel activities were included with the price of our stay. They had 14 restaurants to choose from and swim-up pool bars. I highly recommend all-inclusives in Playa Del Carmen since they offer you the flexibility to try everything and anything on the menu. They also take away the stress of trying to figure out where you’re going to eat every night. You see two (or five…) things on the menu that appeal to your palette? No problem, just order them all (And, by the way…that’s EXACTLY what David did the entire trip)! Speaking of food…you won’t go hungry at this resort! The Market: For night one’s dinner, we spent it at the buffet at The Market. It was Mexican themed night, so of course they brought out the Mariachi band! The band even did a special serenade to our one friend for her birthday, playing Tequila by The Champs. This night we also discovered an amazing new drink that we still love to this day, the Mini Beer. I kid you not, these delicious little shots taste like a creamsicle. They’re made from Licor 43 and layered with Baileys. So, the next time you’re at a bar, try having a Mini Beer shot! La Palapa: Dinner this night was interesting to say the least, but one of my favorite stories, which I am so glad I get to share with all of you. Our friend definitely had a little too much to drink. For dessert that night, I decided to try the cheese platter (because I LOVE cheese). I hadn’t been paying attention to the fact that my friend was actually picking off pieces of cheese from my plate (yes, while I was still eating them) and taking tiny bites of them. He then proceeded to throw them onto his placemat with a face of disgust. Don’t worry – we left the waiter a great tip! All four of us hanging out in a cabana by the pool. The pool bars had to be one of our favorite things to do while at Paradisus in Playa Del Carmen. It was so relaxing to sit underneath the shade in a beautiful cabana, take a dip in the huge pool, or sunbathe while in the pool. Guest service was even greater when waiters would come over to check on you, asking to see if you wanted another cold beverage or if you wanted food from Sunset Grille, one of the lunch restaurants at the hotel. While walking back to our rooms one night, our friend made a bet with us (not one that we agreed with or encouraged) that he could jump from the side of the pool to the bar top without falling. I think you can guess the rest…yeah he took a tumble. And, it had to be one of the funniest incidences of the trip! We were trying to take those cute couple photos underwater in Playa Del Carmen…we clearly failed. It was difficult finding the beach we had to meet at-but we made it! We booked a 6 hour fishing excursion while in Playa Del Carmen that consisted of 3 hours of fishing and 3 hours of snorkeling in a secluded spot with Pezcaribe Ocean Adventure. We booked this months in advance to secure a spot. It was about $400 for a private boat (that was about 16 feet) and crew. If you’ll be in the area with a group of people, I HIGHLY recommend this company. Although there being a language barrier, the crew was adaptable and incredibly friendly. You could tell they really wanted to make our trip the best possible. Waking up at 6 am was a little bit rough for some of us, but we got in a great breakfast, had some dramamine to avoid the possibility of sea sickness, and caught a taxi. Would it really be a fishing trip if one of us didn’t get super sea sick? And who other than our amazing friend that may have had one too many drinks the night before! About 30 minutes out, our friend got sick. Luckily, it was only our group on the boat. The crew drove the boat as close to the shore as possible, and our friend jumped in and swam to shore with no shoes and no cell phone. Somehow, someway, he made it safely back to the hotel. Don’t be fooled…these fish were a lot more difficult to hold than you’d think. The fishing was slow the day we went during our trip to Playa Del Carmen. I caught a barracuda and David caught a lumberjack. With the barracuda, our crew made us fresh ceviche with guacamole. Now, I’m really not much of a fish eater as I just could never really stand the taste. But, this was DELICIOUS and a great way to finish our fishing. Ok, now for the best part of our entire day-the snorkeling! We saw an assortment of fish, stingrays, and sea turtles. It was amazing and by far some of the best snorkeling I have yet to experience. Our crew would even throw pieces of the fish we caught into the water, which created a huge swarm of fish to circle our boat. It was really such a treat! The Green Sea Turtles were so curious about us…They’d keep coming up to our faces and would just stare at us! Xel-Ha is an ecological water theme park in the Riviera Maya, right by Playa Del Carmen! Since there is a mixture between freshwater and the saltwater coming in from the ocean, the water tended to be a bit blurry, which definitely made it difficult to really capture any good GoPro pictures or videos. However, the park as a whole was a fantastic experience with options to snorkel out in the open or through a very small cave, cliff jump, and zip-line. However, if you’re looking for an adrenaline rush, the cliff jumping and zip-lining probably won’t meet that kind of expectation for you. Xel-Ha’s park was also an all-inclusive, which was super convenient for us because we didn’t have to worry about carrying our wallets with us everywhere! The all-inclusive included breakfast, lunch, and drinks (both alcoholic and non-alcoholic). We’d also recommend bringing biodegradable sunscreen. It really helps keep the water clear and the fish healthy. A lot of the chemicals in other sunscreens can actually harm the wildlife! The park had a conservation program for Macaw parrots. There were conches all over the bottom of the sea floor. We’ve never seen them up close, so it was a neat experience! Check out my other article about things to do in Cancun! Great article this is, very useful indeed. This place is very interesting..will definitely check it out! Thanks for the heads up! Great Post! I love to visit Playa Del Carmen when I get a chance. It looks so trendy! You’ll love it! I’d definitely recommend going to an all-inclusive. We all deserved to be pampered for a little bit!